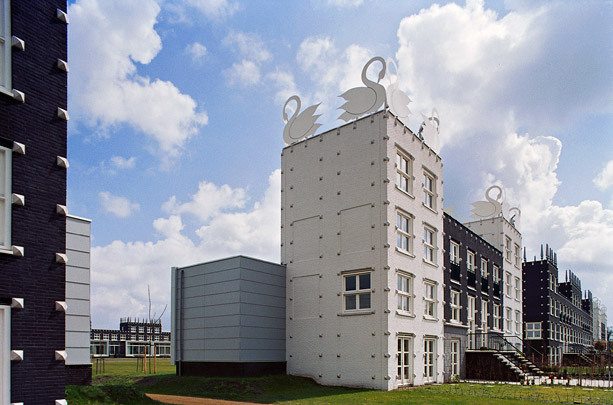 This new suburban area of Heerenveen is inspired by the typology of the country estate as exemplified by nearby Oranjewoud. The meadowland has been transformed into a low-density residential area divided by strips of woodland. Buitenplaats 1, the first of a projected three ‘country seats’, has the formal characteristics of a French garden with a central axis that terminates in a pool and rather than one central country house boasts 50 linked residential units along its edges. Buitenplaats 2 is informally laid out in English landscape garden style with half-buried residential units of varying size, namely a single building containing 20 such units and five units of three dwellings each. The rooftop decorations are unusual, to say the least.